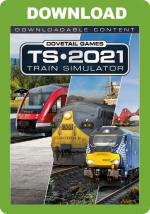 Just Trains - New to Train Simulation? Driving trains on your home computer can be a hugely rewarding and enjoyable experience which will also improve your understanding of real-world rail operations. Train Simulation hasn't been around for quite as long as Flight Simulation, but since the arrival of the Train Simulator and Train Sim World series of sims, rail enthusiasts have really begun to get excited about train simulation. Modern simulators now let you climb into accurately modelled cabs and drive a great variety of incredibly lifelike trains in full 3D virtual landscapes. The realism of today's latest simulations is extremely impressive. Which trains can I drive and where can I drive them? A huge amount of trains from around the globe have been modelled for the various train simulators. Unlike flight simulation, of course, you can't just hop in and go wherever you want - you are limited instead to where the route takes you. Thankfully there's a large and active community of enthusiasts who develop their own routes and share them with other users either by free download or as commercially available add-ons such as our Western Mainlines, London-Aylesbury and Scottish East Coast Main Line routes. Am I limited to real routes only - and can I create my own? You'll usually only find 'real' routes included with the train simulators currently on sale, but there are lots of fictional routes created by those who simply want to have fun driving trains - their routes might be based on real-life operations or they could be a masterpiece of imagination and creativity! It is possible to make your own routes, although this does require a good understanding of how to use the appropriate software tools. Train Simulator includes powerful route editing tools and a user-friendly system for creating and editing routes, forming hills and valleys, painting the textures on the landscape, and positioning houses and other scenery objects where you want them. These route editor tools have enabled hundreds of great add-ons to be released by enthusiasts who devote many months to creating virtual masterpieces for the enjoyment of the simulation community. Do I need to be a computer expert to become a virtual Train Driver? A reasonable working knowledge of your computer is obviously a requirement, but you certainly don't need to know the technical ins and outs of how it all works. Almost all rail simulation software has been designed to be easy to use. Most commercial add-on routes and rolling stock use simple installers which allow you to add them straight into your train simulator, but some freeware extras require you to add content manually by dragging and dropping files from a Zip archive. It's not complicated and good instructions are usually supplied, but if you do get stuck there's usually someone online who will quickly point you in the right direction! Do I need a powerful computer to get started in train simulation? You definitely don't need a supercomputer which could run the Space Shuttle, but you do need a reasonably powerful PC to get the most out of modern rail simulators - the sort of PC, however, which you can find at any good computer retailer. We’d suggest, as a minimum, that you have a Desktop PC running the Windows 7, 8 or 10 operating system, a modern processor with a speed of 3.5GHz or faster, 4GB of RAM, a dedicated graphics card with 1GB of RAM, mouse, sound card and speakers. In general, laptops aren't really suitable as they are usually lower powered in the processing and graphics areas, and often also have smaller and slower hard drives. Ideally, though, you'll want the best hardware your budget will allow, so look for a computer with plenty of RAM and hard drive space and a good graphics card. Most software is now provided as digital downloads, so a DVD drive is probably not essential. It’s worth noting that a good ‘business’ machine may not be as suitable as a machine designed for games – the quality of the graphics card is particularly important for train simulation. Generally speaking, the better specified your PC, the better the graphics and fluidity of your train simulation experience will be. Unlike Flight Simulation, you don't need a joystick or any special controls. Full control is usually managed through a combination of the keyboard and mouse, with a number of keystrokes assigned to various locomotive functions such as accelerating, braking, whistle/horn, and the different camera views. What exactly are a‘stand-alone’ program, ‘add-ons’ and ‘freeware’? A stand-alone program such as Train Simulator or Train Sim World is one that doesn’t need any further software for it to work. You can buy it, install it on your PC and it's ready to use. A stand-alone sim will provide a selection of routes and trains, giving you a good choice of places to go and locomotives to experience, but there is much more that you can add to improve your train simulation world. Add-ons (or expansions, as they are sometimes called) are extra programs designed to expand the host simulator by providing extra rolling stock, new routes, improved scenery and so on. Add-ons are exactly what the name suggests, and they require the host simulator for them to function. The particular host sim required is always clearly marked on the product so you'll know if it's compatible with the host simulator you use. Freeware refers to add-ons which are created by enthusiasts for others to share and are totally free! With an Internet connection you can download thousands of new locomotives, wagons, coaches, routes, scenery, activities and a selection of useful tools, many of which are of the very highest quality. There are numerous rail simulation websites with enormous libraries of freeware from which you can download as much as you like - perfectly legally! • Utilities – Manage your collection of locomotives and rolling stock and generally keep your simulator in good working order to improve the experience and do more than even the simulation developers originally expected would be possible! Do I need to be a railway expert to enjoy train simulation? Definitely not! While some understanding of the various railway terms will be handy, it's not a requirement for getting started, and you'll soon pick things up. The one thing which you will need to know about is signals - not an in-depth understanding, but just the basics. These are fairly self-explanatory and the way they operate is usually described in the manual supplied with the train simulator program. Some people might enjoy hopping in the cab of an express train and driving it between stations or shunting freight in a siding, while others will happily dedicate countless hours to the accurate operation of both their train and route - quite how much time and effort you put in to train simulation is entirely up to you! How realistic are today ’s train simulators? 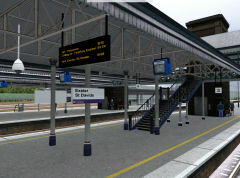 Visually, train simulation is becoming more and more realistic all the time, with photographic textures being used to make lifelike trains, scenery and accurately detailed representations of real routes. The driving experience too is being constantly improved for added realism. 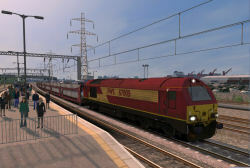 Train Simulator and Train Sim World include detailed 3D cabs in which you can look around by moving the mouse; they also feature dynamic shadows cast across the cab from passing buildings and other line-side objects. If you’re interested in joining the growing ranks of virtual train drivers then we hope these FAQs have been helpful in getting you on the right track. If there’s anything else you’d like to know, you’re very welcome to contact us by email or use our public forum to post a question, where the Just Trains team look in on a regular basis. The forum users are a knowledgeable bunch of enthusiasts who can be relied on to provide helpful answers to any questions you might have. You may also want to check our our Facebook and Twitter pages where there is always lots going on! You can keep up to date with new releases by subscribing to our free email newsletters. Make sure to take a look at our range of simulation software available from Just Trains and if you are interested in flight simulation then our Just Flight website is well worth a visit too!